Luxuriating in a good sleep sometimes takes more than just a nice bed and cushy pillows. That’s where comforters get in the picture. They are intricately tailored and designed to provide additional comfort and warmth when you sleep even in the coldest days. While it warms up the bed, it can also lend some sort of therapeutic relief and hence, rejuvenates the body and elevates sleep experience. If you have a twin-sized bed, you’re definitely in luck for twin comforter sets that typically include a twin comforter, pillow shams, a flat sheet, and a fitted sheet. Other sets can offer more. Although some may think of it as an additional expense, investing in a topnotch comforter is investing in greater comfort and can actually save you more money in the long run. If you’re thinking of revamping your twin bed, it’s probably time to dress it up with a high-quality comforter for added warmth and comfort. Also, the pillows and beddings are a bonus! 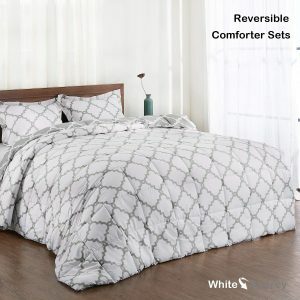 And to narrow down your choices with only the best picks, we’ve come up with reviews and the list of the Top 10 Best Twin Comforter Sets in 2019 and an in-depth buying guide for your reference. For those who seek comfort and warmth all year round, Basic Beyond offers a twin comforter set that includes a cozy and soft twin comforter and 1 pillow sham. 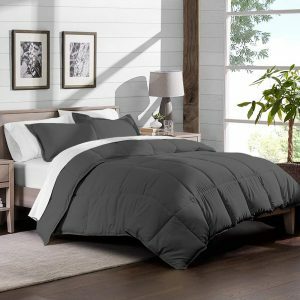 The comforter is a soft brushed microfiber tailored with a down fill for a smooth and soft feel; the moderate thickness guarantees an ample warmth for every season. The down alternative filling quilt adds a decorative detail for a more sophisticated style. With its pre-shrunk feature, it retains its shape, smoothness, and overall quality even after the wash. Truly, the comforter is beyond basic with its reversible feature that allows you to mix and match with your bedding and bedroom interior. You can pick from the grey tones with busy prints or the other side adorned with vivid shades to give your bed a little bit of color. It also promotes healthy sleep with its hypoallergenic properties which is a major factor for people with sensitive skin. Bedsure exhibits elegance and a luxurious feel with its microfiber comforter and lends superior comfort with its breathability and ultra plush quality. This 6-piece twin comforter set is comprised of a twin comforter, a flat sheet, a fitted sheet, 1 pillow sham, a pillow case, and a bed skirt; loaded with bedding essentials that can give your bedroom a modern and sophisticated touch. The comforter features intricate and artistic diamond patterns that give off an exquisite embellishment to your bedroom. As it is a 100% polyester brushed microfiber fabric, it endows durability, a fade and wrinkle-resistant quality that is easy to care for. It is soft and has a perfect fit that adults and kids will surely take comfort with for a nap and a good night sleep. Bright tones and subtle prints are what Comfort Spaces comforter set is all about. Besides the artistic damask patterns and beautiful hues, you can take delight in a soothing and comfortable sleep with its soft microfiber fabric. The premium quality fabric has a crisp and cool feel along with its lightweight feature that keeps you warm and cozy all throughout the year. It’s an all-season comforter, but the hypoallergenic properties elevate the sleep experience that ward off potential skin irritations and allergies caused by mold, mildew, moisture buildup, and allergens. Therefore, people with sensitive skin can take advantage of this feature and wallow in a healthy and clean sleep haven. 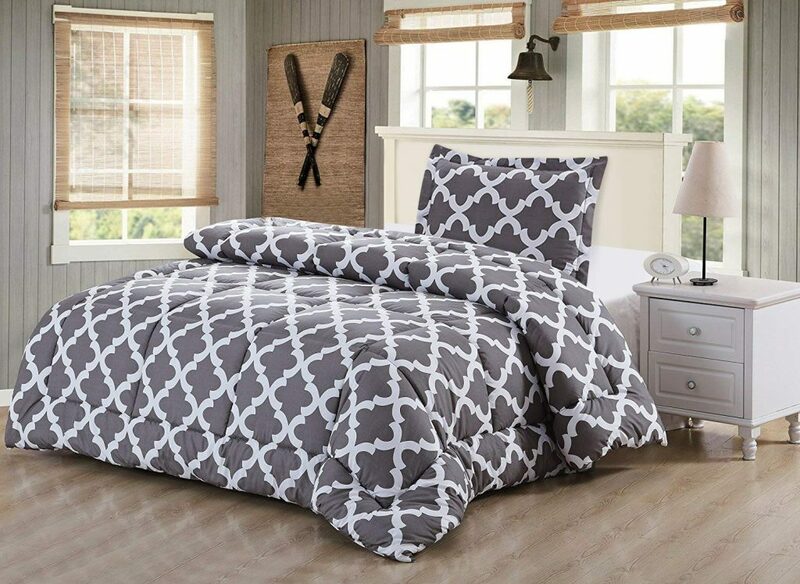 This 3-piece set comes with a lightweight twin comforter, 1 pillow sham, and 1 decorative pillow. 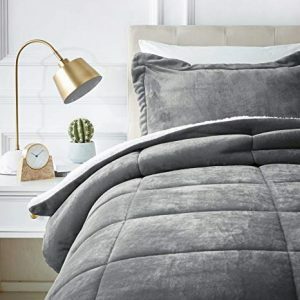 Perfect for a kid or adult’s bedroom, you can curl up and indulge in incredible softness and smoothness of the micromink comforter from AmazonBasics. This twin comforter set includes 1 twin comforter and 1 pillow sham that lets you doze off in a sweet and soothing sleep experience. Made from high-grade faux alternative materials, this lightweight downy blanket is a luxurious and warm treat for everyone and exhibits a feel and appearance of a real fur. It is elegant, sophisticated, and incredibly soft and the double-sided design lends a little bit more function that lets you choose between an ultra-soft micromink side and a cloud-like faux sherpa fleece. Both have exceptional comfort and soft feel and you can pick out where to snuggle and sleep in. 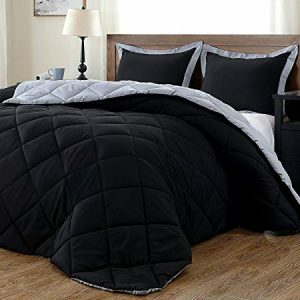 In addition, the comforter is gives you no hassle in maintenance; it is machine washable, durable, and prevents sliding and fraying with the contemporary box-stitch design. 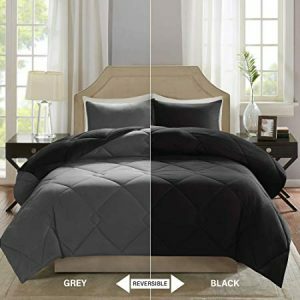 Luxuriate in a calm and restful sleep with a premium quality microfiber comforter set from Elegant Comfort. The sophisticated appearance, cozy and luxurious feel come from the fine yarns and ventilated micro weave that eliminates sweat, stain, and moisture while giving you the maximum comfort and warmth all day and night. Such hypoallergenic properties make the comforter, pillows, and blankets fitting for allergy sufferers and people with sensitive skin. The design also exhibits vibrant and fade-resistant colors that do not easily wear off even after regular use and frequent washing. 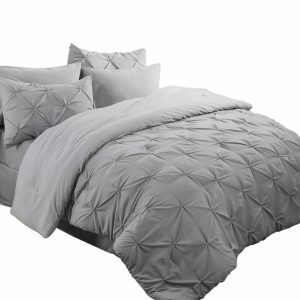 Such durability is also reinforced with the diamond patterns that keep the comforter from falling off the bed. The patterns are also a form of aesthetic that will revamp your bedroom with a lavish and modern style. With this 6-piece twin comforter set, you’ve got the basic bedding essentials at an affordable price. Snuggling in the midst of summer calls for a cozy, warm, and a lightweight comforter. But as it is typically known for its thickness, using a comforter seems to be the least option. However, Downluxe offers an ultimate solution with its lightweight comforter set in twin size and 2 pillow shams included. The comforter is lightweight but provides ample warmth even in the hottest climate of the year. Truly, it is a practical option for a high-quality, plush, and cool comforter to sleep in. Although it is lightweight, it showcases moderate thickness that’s just enough to keep you warm during the cold season. Made of microfiber fill, it guarantees superb softness for a comfortable and soothing sleep any time of the day. It also exhibits a classic quilting design for a more contemporary and luxurious vibe. Besides all these features, it is hypoallergenic thus promotes healthy and better sleep. Take delight in an exceptional comfort and optimum warmth with the Vixie comforter set from Comfort Spaces. Apart from the luxurious feel and exquisite comfort, it lends a double treat and with its reversible feature; it allows you to indulge in a soothing and sound sleep with the color of your choice. Truly, it leaves no room for dull tones but only with vibrant and stylish embellishment. It even has the pantone color of the year – living coral! Made of an ultrasoft microfiber polyfil, it endows a plush and sophisticated feel that highlights the maximum comfort and elevates your aesthetic taste as well. As it is lightweight, you can take advantage of its comfort and warmth all year-round whether it is hot or cold. When you’re all done, you can toss it in the washing machine for a gentle washing! Utopia Bedding has its share of beautiful comforter sets that exhibit stunning quality and superb softness. Among its collection is the twin comforter set that It is made of a brushed microfiber embellished with a classic quilting design. The high-grade microfiber material lends maximum comfort and incredible softness that lets you revel in a sound sleep all day. The patterns and prints are an inventive design but the solid quality and intricate tailoring make it inevitably worth the value and price. 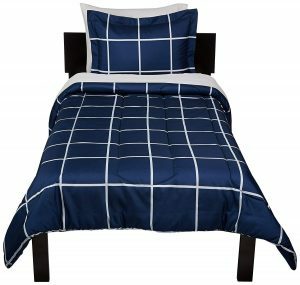 It is a durable print comforter set that defines a well-crafted and soft fabric and a quality that resist stains and tearing. With thorough sanitation of this man-made fiber, it eliminates impurities such as dust, oil, and dirt and hence, provides a healthy and clean bedding for everyone. The Bare Home all-season is made of double-brushed microfiber that promises premium quality and softness. It boasts its luxurious feel from its plush and siliconized fiber filling that gives off ample warmth and exceptional softness. With such features, you can indulge in a restful and soothing sleep any time of the day. It provides warmth but exceptionally lightweight which makes the comforter an ideal pick even the hottest days of the year. 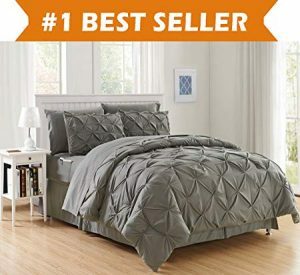 The quilting design is crafted with piped edges that lock the siliconized gel in and therefore, retains the shape, softness, and overall quality. The comforter also exudes elegance that can match any bedroom decor. And if you have sensitive skin or suffering from allergies, this comforter set is hypoallergenic which deters allergies and skin irritations. Taking the first spot on our list is another entry from AmazonBasics that includes the basic bedding essentials that you can use to set up a comfortable and warm sleep haven. It includes a twin comforter, a flat sheet, a fitted sheet, a pillow sham, and a pillowcase. Made of polyester fabric, it lends enough warmth that embraces you all throughout the cold night and even when summer hits the season. It offers a soft and gentle softness and texture that you can snuggle in. Crafted with care, AmazonBasics intricately tailored the comforter with reinforced stitches to keep the filling from shifting. The quilting classic design lends a simple but elegant vibe that adorns the bedroom decor and bedding with additional decorative details. COMFORT: Probably the major reason why you’re considering of getting a comforter set is to increase the comfort your bed and mattress provide. Therefore, it is a highly significant factor to check how comfortable the comforter is and the other items included. The quality and material are important factors that define the overall comfort and hence, provides a comfortable sleep haven that lends ample warmth during the cold and breezy season and an exquisite body relief. MATERIAL: The comforters and the other items included in the set may be tailored in different kinds of material. Polyester, brushed or plush microfiber, wool, silk, bamboo and cotton are some of the common material sources and each has its own exceptional beauty, opulence, softness, and comfort properties. Whatever material you opt for, make sure the stitches and trims are carefully and thoroughly done. DESIGN: There is a vast array of designs to choose from. You can opt for patterns and colors that would match your bedding and bedroom interior. There are bright and busy patterns that would go well with plain wallpapers while white, black, grey, or neutral tones can suit your minimalist style. OTHER FEATURES: Apart from the primary features, don’t forget to delve into other vital aspects that can affect the overall quality of the comforter set and if it’s really worth investing in. Health is a significant issue when choosing a bedding or comforter thus, it can be a lot better if the one you’re buying features hypoallergenic properties that deter moisture build-up, dust mites, allergens, mold, mildew, and bacterial growth. Therefore, you can revel in a healthy and better sleep. Everyone deserves a good night sleep. And one of the best ways to comfortably doze you off is to invest in a great quality comforter. Besides the superior comfort and deluxe warmth, a comforter can also enhance the quality of your sleep keeping you ramped up and prepared for the next day. 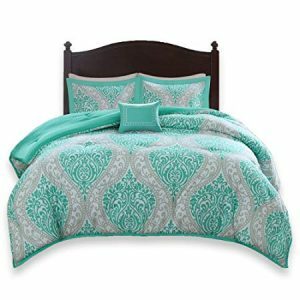 Comforter sets come in a wide range of sizes and a variety of items included. But if you’re looking for a nice and cozy pick for your twin bed, they are a ton of twin comforter sets to choose from. Our buying outline and list of the Top 10 Best Twin Comforter Sets in 2019 can be your guide. A twin comforter set is usually comprised of bed sheets like fitted and flat, pillows, pillowcases, and of course, a twin comforter. Purchasing one for yourself is definitely a wise and practical decision that you and your family can benefit from today and for many years to come!